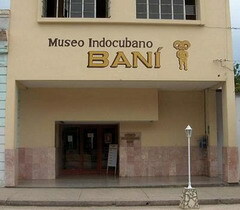 The Indo-Cuban Museum of Baní, in Banes, in the eastern province of Holguín, is an excellent option for both national and foreign tourists interested in aboriginal archeology. According to experts, the museum exhibits more than 22,000 archeological artifacts from two stages of the primitive community, Appropriation and Productive Economy. It also exhibits pieces linked to the meeting between aborigines and Spaniards, some of which were found in major archeological sites like Chorro de Maíta, Potrero del Mango, Loma Baní and El Porvenir. The museum has 15,000 exceptional artifacts found in more than 100 archeological sites around Banes. The institution is a referral center for the study of Cuba's aboriginal communities and one of its most important pieces is a gold idol unearthed in 1947.